Based on our more than 30 years teaching experience, our teaching method is a unique combination of the famous Russian piano tradition and our innovative ideas. The way we teach piano encourages students to develop their musical abilities to the peak of their potential. A great emphasis is placed on the beginner’s stage of learning piano as we understand: the right start makes a huge difference. Our “Little Pianist. First Steps” books focus on learning correct hand position, flexibility and freedom of movements and good playing habits. The results are amazing! The Method gives young children such a remarkable jumpstart, that our students complete 8 Grades of Piano (RCM) after only 3 years of studies. The most talented of our students usually achieve Grade 10 – ARCT levels after 5 years of studies. 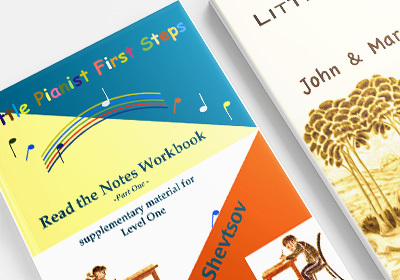 For the best results, we recommend to start learning piano at the age of 5 and in certain cases 4 years old. We believe that all children have a potential to achieve very advanced level in playing piano if they have an opportunity to use and enjoy the right way of learning. We feel really lucky to be your students and enjoy your lessons very much. Thank you for taking us as your students. My both daughters Jessie and Angela have gained valuable instruction and improved greatly under your teaching. Along the way of piano studying of both Jessie and Angela, you have been an important figure that leads them to thrive. They had great performance in a number of competitions and enjoyed piano so much now. My family and I want to thank her for your experienced teaching and care! Thank you! … thank you, Dr. Victor for sharing with me the true beauty of music and teaching me different aspects of piano music from technical excellence to moods, feeling and expressions. I will miss you and your uplifting Saturday morning lessons. Thank you for being such an awesome piano teacher. I am sad that I have to stop learning from you. It’s been a wonderful and interesting journey, even though it was challenging at times. I wish you good health and happiness. I can’t believe that it’s already been four years since my first piano lesson. Throughout the past few years you’ve given me many lessons that I’ll remember and appreciate for the rest of my life. I can honestly say that I could not have asked for a better teacher. Your patience and your dedication to music has motivated me to keep practicing to perfect my skill, build a strong character, and I believe this is what makes you great. Thank you so much! You are the best teacher in the world. Dear Dr. Victor, thank you for teaching me. I like the pieces you choose for me to learn so much! thank you for teaching me piano. Your lessons are always so interesting and fun. I learned a lot of techniques from you. Thank you for helping me to prepare and receive the first place in Canadian Music Competition. During this year I had difficult moments and you taught me to be strong and believe in myself. I learnt how to work hard and overcome any obstacles. I learnt to appreciate a wonderful music journey to perfection!